I've been meaning to write about this trip for some time now but you know how life gets in the way. Procrastination sets in and now three months have passed - it already feels like it's time for another adventure!. But since nothing is on the horizon, I'll just have to stick with the memories and pictures I have from this snow-filled trip. Which was by far the most beautiful piece of America I've seen to date. The journey started EARLY on a Sunday morning in Houston at Hobby airport where I boarded a fairly new 737-800 en route to Denver where I would meet he rest of the crew - the Wolfpack. The Wolfpack is a rag-tag crew made up of miscreants and underachievers that just so happen to enjoy hiking countless miles through bear infested forests and scaling mountains at altitudes for which no Texan is acclimated. TRAVEL TIP: try to avoid scheduling flights with only 45 minute layovers when a plane switch is required...even with no delays it adds to your already elevated travel stress levels. After catching the flight in Denver (with approximately 7 minutes to spare) the Wolfpack made the short trip to Salt Lake where we began the 6 hour drive to Yellowstone. Driving through northern Utah and Southern Idaho reminded me a lot of driving through West Texas, except with more mountains and fewer Whataburgers - you win some you lose some. Being as we drove up from Salt Lake, we entered the park through the town of West Yellowstone. This also meant we drove through a fraction of Montana and I got to check off three new states in a matter of 20 minutes. The drive in from the west is quite beautiful, like the entire area. We followed the Madison River along highway 191 with our eyes paying attention to everything but the road. The Madison Valley is full of wildlife as well as narrow grasslands that provide perfect viewing quarters for the grazing Elk and Bison. We were lucky enough to spot a gang of Elk; yes a gang... Crips-Bloods-MS13? I'm not sure. Below are a few pictures from the Madison Valley. After getting checked in to our lodge we took a quick walk/hike to the Grand Canyon of Yellowstone (GCoYS) which is pretty damn impressive, even when compared to the actual Grand Canyon. The iron ore in the rhyolite canyon walls has created beautiful streaks in all shades of red. The centerpiece of the GCoYS is Lower Falls - a 310 foot waterfall that fills the entire canyon with the sound of roaring water. The views up east and west along the trails are amazing, especially at dusk. Some of my favorite photos of the trip were taken along the Yellowstone River. The next morning we woke up, bundled up, and headed out to see the Grand Prismatic Geyser...followed by some hiking and of course a stop at Old Faithful because...duh. On the way, we made a pit stop at an overlook where there were some bison grazing in the field. 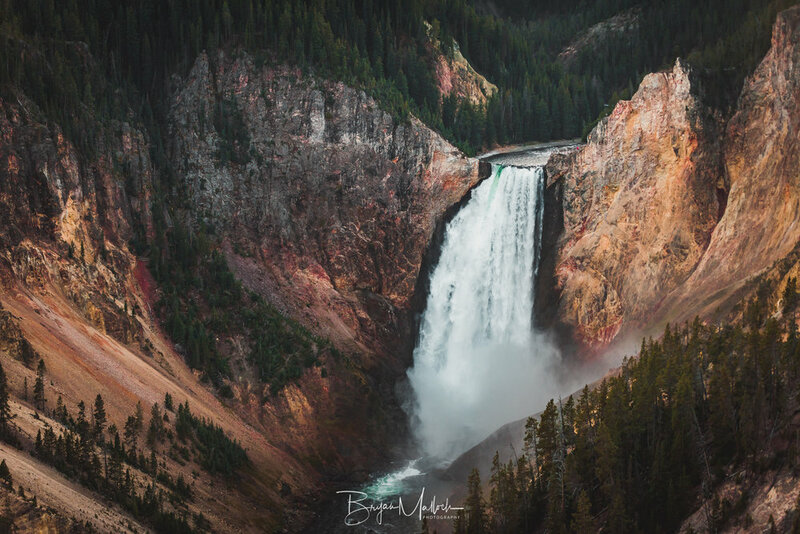 There is a so much natural an unexpected beauty in Yellowstone...scenes like this give you a glimpse of what this area looked like thousands of years before roads ever disturbed the tranquility of northwestern Wyoming. Grand Prismatic was colorful, crowded and cold. Obviously the water was warm, being heated by underground lava thermal vents and all, but mixed with the cold air - steam and fogged glass was the name of the game. Not the best for getting photos but the exfoliation felt great. After managing to safely navigate the wooden planks around Grand Prismatic, we made our way to a trail that would take us to Fairy Falls with a stop at the Grand Prismatic overlook on the way. This was our first venture off the popular paths and as such we were on high bear alert. All for naught though as we were able to hike through the woods and back without losing anyone to hibernation food storage. At old faithful we were able to sit down and take a minute to relax and drink a cold one (Thanks Macie!) while we waited for the next eruption. This was also about the time the cold front started to move in. The winds shifted and grew stronger just as Old Faithful began to show its might. Starting to freeze every time the sun was obstructed by the clouds may have something to do with it, but I'd rate the Old Faithful experience at a solid 6/10. Interesting for sure, but the long wait for the payoff is a bit of a letdown unless you're in desperate need of a break from your feet. That said, it is a Yellowstone landmark and still something you should check out if you're ever in the park. By nightfall, the cold front had really established itself and us Texas kids were feeling a bit out of place. The rain was starting to turn to snow and by the time we walked out of dinner it was a full blown blizzard! ...Well it was snowing anyway. What is this white stuff?? The next morning we were greeted by almost a foot of fresh powder, a Christmas miracle in September! Unfortunately we were also greeted with lots of closed roads. Plans to check out the wildlife in Lamar Valley were shelved as the road north was closed, just like all the other roads in the park. Instead we all piled into the Jeep to see how far we could get before the popo turned us back. Short story short, about 2 miles. On the way back to base camp we stopped on a pull out that gave us access to a large open field where we had seen Elk on the way out. There were none in the field when we came back through but we really had nothing else to do so exploring we went. The snow was still really coming down at this point and I couldn't help but feel lucky to take this sight in at one of the most naturally beautiful places in America. It was a truly surreal experience. I felt a bit like Jon Snow wandering through the North and trying to avoid white walkers (bears in this case). That's why when Tyler randomly said "I don't know where the keys are" no one in the group really panicked. Dude is just goofin around like he always does. Nope. Not this time. Not in this frozen field of misfortune. I could go on and on about the hours we spent searching for these keys, the lengths we went to to try and find someone that could help...including finding a park ranger with a metal detector, but ultimately, we spent the day trying to find those keys and never found them. Legend has it those keys are still waiting to be found to this day....Luckily, if you have a whole lot of money, you can get towed to the south entrance where Enterprise is actually allowed to pick you up. Now, pictures since that's why you're here anyway! Grand Prismatic as seen from the walkways. This would be the perfect time for a helicopter tour! Hooray we can't find the keys!!! Millions of years to carve this canyon, a few moments to stop and enjoy it before succumbing to the cold. The view of the canyon from above Lower Falls. Roughly 310' from this spot to the river below.